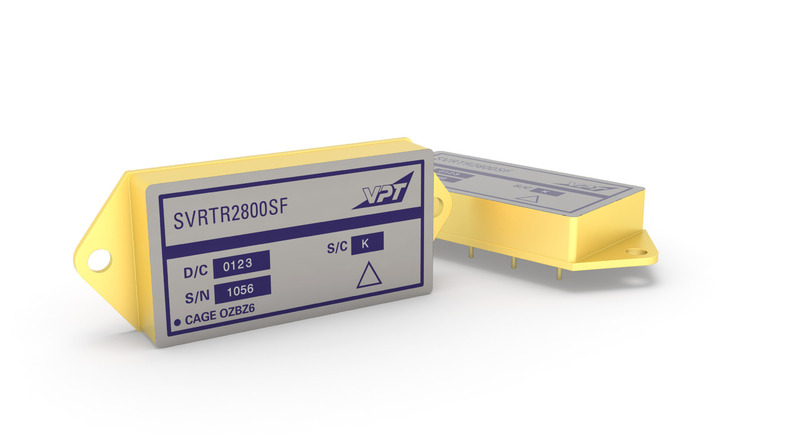 VPT’s SVR Series of DC-DC converters deliver a power solution for the low-Earth orbit (LEO), medium-Earth orbit (MEO), geostationary orbit (GEO), deep space, and launch programs. The SVR series is rad-hard qualified to MIL-PRF-38534 Class K on DLA SMDs, and designed for TOR compliance. Space-level characterizations include a total ionizing dose (TID) performance to 100 krad(Si), with single-event effect characterized to 85 MeV-cm2/mg with no dropouts, shutdowns, latch up, or burnout. Performance in space of these parts is guaranteed through the use of hardened semiconductor components, radiation lot acceptance testing on non-hardened components, and analysis. All characterizations are performed according to VPT’s DLA-approved RHA plan per MIL-PRF-38534, Appendix G, Level R.
Delivering 40 W from a small hermetic package, the SVRTR Series DC-DC converter is guaranteed radiation hardened including enhanced low dose rate sensitivity (ELDRS), plus it is designed for compliance with the Aerospace TOR requirements for space power systems. Additional features include (on the DLA SMD 5962R132090 single outputs of 3.3, 5, 12, and 15 V; up to 40 W output power; radiation-immune magnetic feedback circuit without the use of optoisolators; a voltage range of 18 to 37.5 V; high input transient voltage (50 V for one second); and a low output noise.